Are you dying to know how first-year students experienced the previous study year (2017-2018) at the Faculty of Spatial Sciences? Keep calm, Nynke and Thijs got you covered in this article! holidays, I emailed the study advisors Nienke Harteveld and Saskia Enuma. I had to do an extra assignment and then I was accepted! I felt really nervous about starting a second bachelor, but in the end, it was and still is, a great experience. The introduction week is a really nice opportunity to get to know a lot of people. First of all, you meet the people in your learning community and, second, in course meetings you meet a lot of people from other learning communities as well. The faculty of spatial sciences is a small faculty, so I quickly felt home and made friends. In this study, there are a lot more group projects than I expected. It is fun to work on a project together with students, but it can be challenging as well. I think it is very educational to work in group projects and I’ve learned a lot about it the past year. Most often, you do the group projects with students from your Learning Community (LC). It is nice to do this because you get to know them better. The Learning Communities are not all about studying. With my learning community, we had to do three learning community activities, which could be anything as long as they were study related. They could be activities that Ibn Battuta organized (such as lectures or excursions), but they could also be activities that we came up with ourselves. My learning community and I went to the Lecturer of the Year Lecture, had a tour at the new Groninger Forum and we went to a movie. You can actually get subsidized by the faculty to do these activities if they cost you any money, so that makes them even more fun, haha! The Lecturer of the Year award is a yearly award for the best lecturer of the year. Last year (16-17), this was Viktor Venhorst and we all went to his lecture. I absolutely recommend you to visit a lecture with your LC because they are interesting and enjoyable. I am in the Lecture Committee (Le’cie) this year, so I hope to see you there! We also visited the construction site of the Groninger Forum. The New Groninger Forum is currently under construction and will in the future be housing a library, a cinema, a bicycle park and a lot of other things. The new Groninger Forum can be found at the Grote Markt and its completion is planned in 2019. One of the students of the Faculty works at the VVV office and he gave us interesting insights into the construction of the new Groninger Forum. The VVV office can also be found at the Grote Markt. The movie we went to was about life around the Arctic Circle and it was screened in DOT. DOT is a cinema located at the city beach and has a 360-degree screen. It was a really cool experience. I liked going to the movie with my learning community because the setting was informal. I had a great first year at the Faculty of Spatial Sciences. I hope you will enjoy this study just as much as I do! First of all, I would like to welcome you to the University of Groningen, and especially to the Faculty of Spatial Sciences. I hope you all enjoyed your summer holidays and I hope you are all totally rested and prepared because, from this point onwards, your dedication to this study is required. Of course, you will have plenty of time for relaxing, socializing and other activities alongside studying, but especially in the first weeks, I’d advise to mainly focus your time on your schoolwork. I found out the hard way, by failing one of the semester 1A courses. studying, it won’t have to be very difficult, but still, around 35% of the first year student stopped throughout the year. What I found nice about this study, is that it’s such a small scale study. That makes it easier to get to know the other students from your study (and faculty), it’s simpler to get in contact with your lecturers when needed, and it makes the study more personal in my opinion. With that last statement am I meaning that you won’t get the feeling that the lectures are just ‘teaching the mass’, but that I experienced them as very informal and interactive. only can you get a discount on your study books, but it’s also a very accessible way of getting to know new people in Groningen. My first real introduction with Ibn Battuta was the introduction weekend on Ameland. From then, I regularly participated in activities they organized and I went with them on trips, e.g. to Frankfurt and Blaimont. Furthermore, once or twice a month on Tuesday, they organize a social drink in ‘t Gat van Groningen, a bar in the Poelestraat. These social drinks are perfect for meeting new people or just for hanging out with friends. now to live the optimal student life. This was a short summary of my experiences as a first-year Spatial Planning and Design student at the Faculty of Spatial Sciences. I hope I have informed you well, and I hope my experiences may help you the upcoming year. What rests is wishing you all good luck with this study, and don’t forget to also live your life! 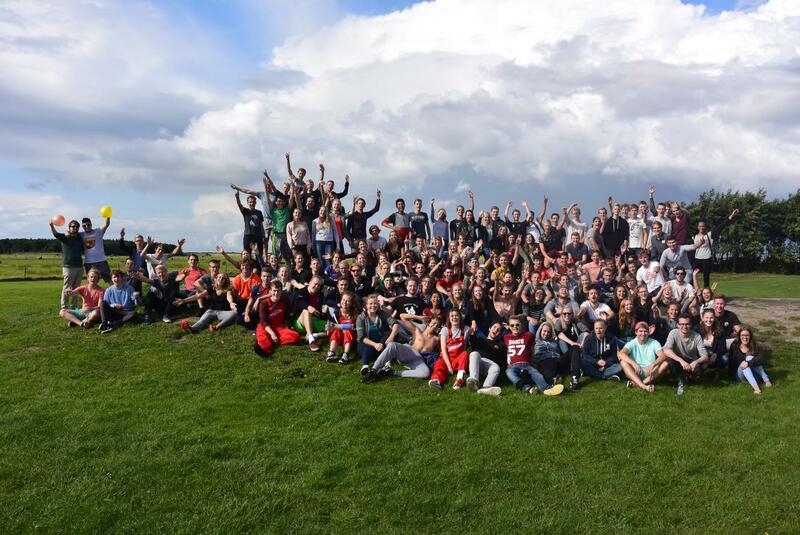 Thijs and many other first-year students of the Faculty of Spatial Sciences at the introduction weekend in 2017 (source: Ibn Battuta). These articles were first published in the First year edition (Year 49 of Girugten – issue 01 – september 2018).